5-axis competence and precision. Process dependability included. Current discussions about 5-axis machining centres are ongoing. Whilst some sceptics claim that more challenging programming or higher demands on the machine and the control speak against the technology, insiders emphasise the benefits of faster machining resulting in savings potentials plus higher precision and reduced tool wear due to shorter milling paths. That is also why HELLER placed the focus on this particular technology during WerkTage 2014, being already the 7th edition of this event. With seven machining centres live in action, guided plant tours and moderated panel discussions, the event was again fully geared towards the tasks of the users. Already ahead of the event, organisers were aware of the expected number of visitors and an international response to WerkTage 2014. However, none of them had anticipated that they would be welcoming more than 800 guests from 20 different countries. With a share of more than 60%, the majority of visitors still came from Germany, followed by guests from Switzerland, Portugal, Spain and the US. Just as diverse as the nationalities of visitors to Nürtingen were the branches of industries interested in economically viable manufacturing solutions, including representatives from the automotive industry and its suppliers, machine builders, mould and die manufactures through to aerospace companies. 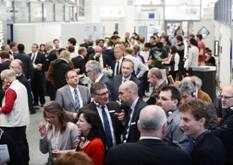 The 7th edition of HELLER WerkTage provided visitors with an opportunity to gain an understanding of tomorrow’s trends. Aspects presented included solutions offering precision and 5-axis competence and a comprehensive approach to the process chain. HELLER demonstrated its full spectrum of productivity with seven machining centres on display, machining a diverse range of components and meeting a wide variety of requirements. An out-facing head solution and trochoidal milling, universal application using oversized tools and boring in all its facets were presented on three 4-axis machining centres from the H series. Three 5-axis machining centres from the F series were the focal points in terms of 5-axis machining. Model FP 4000 demonstrated high precision with in-process gauging and 5-axis machining from 6 sides, whilst model FT 4000 showcased strategic 5-axis simultaneous machining. Additionally, HELLER cycles and combined mill/turning operations were demonstrated on 5-axis machining centre model CP 8000. Live machining demonstrations were complemented by a total of three new developments and numerous product enhancements, including the expansion of the process chain in crankcase manufacturing with HELLER CBC (CylinderBoreCoating). This year for the first time, practical machine demonstrations were accompanied by moderated panel discussions. They also provided an opportunity to focus on a number of decisive questions: implementation in practical application or the questions of why, when or which solutions are chosen and how these strategies are transferable to other fields. Volker Schmitt, Head of Industrial Engineering Manufacturing at Linde Hydraulics GmbH in Aschaffenburg, for instance, illustrated cost-effective manufacturing of special cylinder blocks for axial piston pumps through use of a 5-axis machining centre. Up to now, these components have been manufactured using 4-axis machines with an additional attachment axis on the pallet. One specific type of cylinder block required machining in two setups, resulting in a very laborious process accompanied by a loss in quality and repeatability. To enable machining of the inclined bores in a single setup, a 5-axis solution was needed. For Linde Hydraulics, the decisive advantage was that the FP series of machines and the fork-head unit allowed machining at negative angles below the centre axis. The Aschaffenburg-based company required machining at a negative angle of 21°. The above approach may sound a little strange to Karl Semmelmann, Head of Engineering and Development at MDS Abele GmbH & Co. KG. The company based in Mühlacker is required to achieve a process capability of Cm/Cmk 1.67. As a whole, the component in question required extremely high manufacturing precision in alternate machining. Due to the required Cm/Cmk 1.67 capability, tolerances were reduced from 0.05mm to 0.035mm. With daily batch sizes of 50, 220 and 500 pieces, precision and process capability have to be provided over a long period at high process dependability. That is why the company from Mühlacker opted for two 4-axis machining centres model H 4000 from HELLER. The machines commissionined in 2013 were immediately used for production. Although the company had expected them to require a certain start-up phase, they already reached 95 to 96 percent availability without the use of automation. That exactly was the decisive factor for the company from Mühlacker. According to its calculations, the cost of power has increased by 60 percent in the last 5 years. Independent of political decisions, the company assumes that the increase is likely to continue in the coming years. This year, HELLER also welcomed renowned process chain suppliers to the event. In particular automation manufacturers KUKA, SCHULER, GÜDEL, LIEBHERR, RILE and FASTEMS provided information about solutions for stand-alone machines and linked machining centres. Additionally, the perfect symbiosis of a virtual and transparent machine provided in-depth insights. HELLER showcased a transparent machine model FP 4000, illustrating the quality of the machine structure, whilst virtual machining revealed the possibilities for optimising the process chain from the idea to the finished part. The programme was rounded off with a presentation of the complete portfolio of HELLER Services and our partner WENZLER, attractive financing solutions and a comprehensive exhibition of workpieces and finished products of numerous HELLER customers. As during previous editions, HELLER WerkTage 2014 also provided an opportunity to visit Plants 1 and 2. In addition to insights into manufacturing, sub-assembly installation, final assembly and vocational training, visitors had a chance to learn more about the assembly of crankshaft machines, large-part manufacturing and retrofitting “Made by HELLER”.